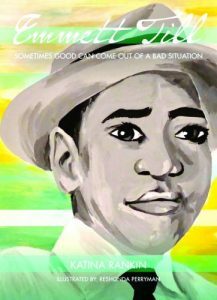 A newly released paperback, Emmett Till: ‘Sometimes Good Can Come Out of a Bad Situation” (CreateSpace June 7, 2018), is an immersive, thought-provoking story about a family passing on the legacy of the civil rights movement by learning about a 14-year-old boy who was murdered for whistling at a woman. Author Katina Rankin gently but boldly diverges a story from Mississippi’s once racially, hatred-filled atmosphere to create her first in a series of children’s civil rights books set in the Magnolia State. Long-time devotees of the author’s playful children’s book that dispels rumors and misnomers about Mississippi join together in praise as this proven writer breaks into a new space. Rankin is also the author of Up North, Down South: City Folk Meet Country Folk. Emmett Till: “Sometimes Good Can Come Out of a Bad Situation” opens in a home in rural Mississippi with Renee King, a curious, young 5th grade girl, with a book in her hand asking her mother, Tonya, “Mommy, what’s wrong with his face?” Careful not to stir up racial tension, Tonya calls the entire family into the living room to have a teachable moment of morality, social equality and optimism. The idea for Emmett Till: “Sometimes Good Can Come Out of a Bad Situation” came as Rankin covered a number of civil rights stories and couldn’t shake the historical relevance in today’s political climate. The first line of the book: “Mommy, what’s wrong his face?”, sat in the back of Rankin’s mind for nearly a year before a trip back home to Mississippi gave her the perfect setting for telling the story in an age-appropriate manner for middle school students. In the book, the back dirt roads and the loving atmosphere of her mother’s home provides the backdrop for a disturbing tale of abduction and deception, but leaves you with a sense of hope and that one day justice would be attainable.